7,500 SUCCESSFUL NPOWER NTAX VOLUNTEERS NOT CHOOSEN BY US: NPOWER LATEST NEWS. According to the npower team, the npower tax recruitment process is a 7 stage process out of which Npower is only responsible for stages 1 to 3. 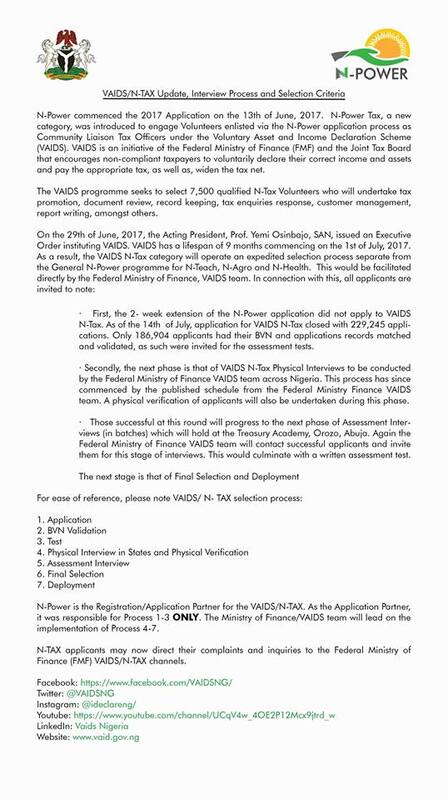 Having successfully completed this 3 steps, the other steps of stage 4 to 7 are being handled by the federal ministry of finance.According to the NPOWER TEAM, 229,245 persons applied for the NTAX scheme out of which 186,904 had validated BVN details and as such were cleared to write the assessment test. The candidates who were successful at the test proceeded to the next stage of VAIDS NTAX physical interview according to a schedule published by the federal ministry of finance. This stage includes a physical verification. Candidates successful at the physical verification will proceed to the next phase of assessment interview which will hold at THE TREASURY ACADEMY, OROZO, ABUJA. 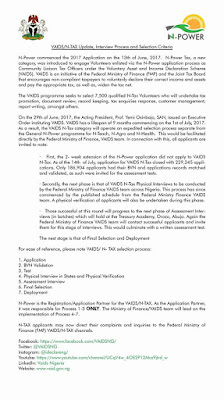 It is the duty of the federal ministry of finance VAIDS team to contact successful candidates for the NTAX ASSESSMENT INTERVIEW IN ABUJA. This will culminate with a written assessment test in Abuja. It is the successful candidates at the NTAX ASSESSMENT INTERVIEW IN ABUJA THAT WILL BE FINALLY SELECTED AND DEPLOYED AS 7,500 NTAX VAIDS VOLUNTEERS. The NPOWER TEAM HAS REITERATED THAT IT IS NOT RESPONSIBLE FOR SELECTING THE 7,500 SUCCESSFUL NPOWER NTAX VOLUNTEERS. To prove this beyond all reasonable doubts, it has gone ahead to provide communication channels where those who are aggrieved or need clarifications can channel their grievances, complaints or enquiries. Please has anybody under npower tax receive his/her deployment letter yet. Am one of the successful ntax but still yet to receive any deployment letter. Plz is the any information I don't know yet.